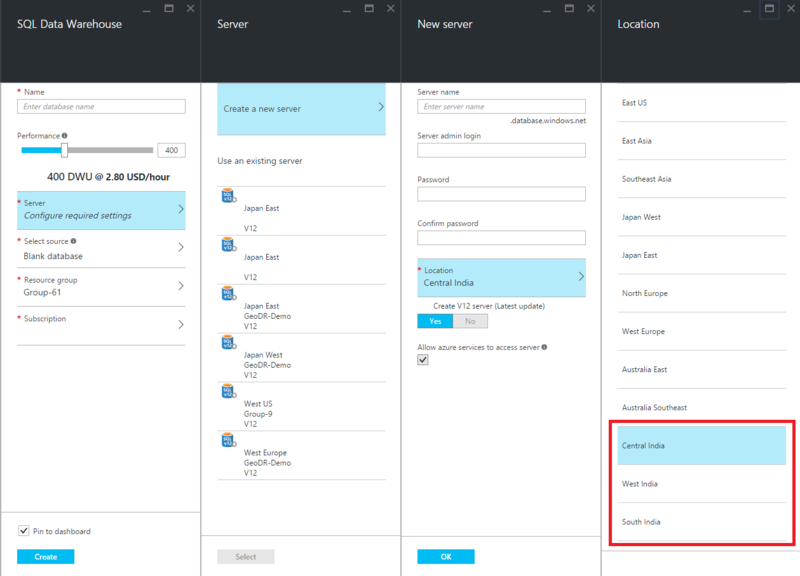 We’re excited to announce the public preview availability of Azure SQL Data Warehouse in all three Azure India data centers (Central, West and South India). The availability of Azure SQL Data Warehouse in the India data centers expands our regional support for scaled out data warehouses, thus allowing us to provide our customers with the ability to choose from an even wider number of geographies. Optimized – A Massively Parallel Processing (MPP) architecture designed to run some of the largest data warehouse workloads using a divide and conquer approach. Scalable – SQL Data Warehouse separates storage from compute allowing each to scale independently (dense compute, balanced, dense storage). This separation gives customers the ability to change the compute resources whenever their business needs such as bursts for data loading or heavy analytics/aggregation processing. Integrate – Based on SQL Server’s proven relational database engine and includes the features you expect from an enterprise data warehouse. If you already know Transact-SQL, it’s easy to transfer your knowledge to SQL Data Warehouse. Hybrid – Using PolyBase in the cloud allows users unprecedented ability to merge relational and non-relational data through a single language (T-SQL). To create a new SQL Data Warehouse in one of the India data centers, follow the Create process, choosing a new logical server in one of the India data centers (Central, West or South India). As with all new feature releases, we would love to receive your feedback. Feel free to leave comments below. If you need any help or have questions, please reach out to us on the developer forums on MSDN or StackOverflow.